Vegetables have been part of the human diet from time immemorial with their usage starting before the advent of agriculture. They are a rich source of vitamins, minerals, trace elements and dietary fiber, and therefore play an important role in human nutrition. Consumption of vegetables provides taste, palatability, increases appetite, and prevents constipation by providing roughages which help in movement of food in the intestine. It has been observed that vegetable consumption reduces the risk of cancer by 15%, cardiovascular disease by 30%, and mortality by 20% which is attributed to the presence of antioxidants like ascorbic acid, vitamin E, carotenoids, lycopenes, polyphenols, and other phytochemicals. A diet rich of vegetables protects human beings from the risk of most common epithelial cancers, several non-digestive neoplasms, and oral, pharyngeal, colorectal, esophageal, and breast cancers. 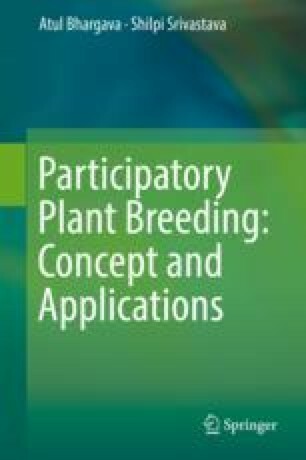 Participatory plant breeding has been used for a number of vegetables ranging from leafy vegetables like amaranth and broccoli to tuber crops like onion and taro. The chapter discusses the various approaches of PPB followed by vegetable crops in different parts of the world.